Designed to suction clamp to your windscreen, the small unit, which can fit in my hand, provides a forward facing camera to record everything that happens on your journey in stunning HD. 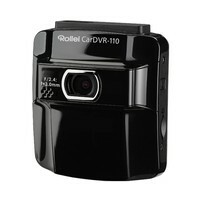 The CarDVR-110 is a very neat unit that records very high quality video at 1080p resiolution and 30fps in .mov format. These can then be played back on the unit or on your PC using either quicktime or the supplied SuperCar software. The hardware is excellent and easy to control, with one minor foible about the power button. If you need to record your journey either for security or as a travelogue this is an excellent choice. We did have one major concern that the screen remains on whilst recording and shows the video whilst driving. We felt this was distracting and you may want to check legality before purchasing. It is a shame as otherwise it is a truly excellent device. Our first impression of the CarDVR was poor as we could not use it out of the box. To do anything the device requires a MicroSD card of at least 8GB in siz and this is not supplied. Nor is it highlighted on the packaging as being required. You can also manually power off and on pressing a button on the side of the unit. We found powering off very awkward as the unit seemed to always want to power straight back on. We usually ended up resorting to the time out after unplugging it form the socket. Recording is by default automatic when powered on and the unit records rolling 30 second clips overwriting fromthe first once it runs ou of space. Of you want to save a recording in case of an emergncy pressing the OK button will secure the current recording and subsequent ones until you press ok again. This is quite easy to do. There are four easy to press buttons underneath the screen labelled for back, up, down and OK. The screen shows alternative meanings for these buttons depending on context but it is all pretty easy to follow. If you don't want to worry about use interaction in the case of a collision you can set collision detect mode which will automatically save any video if the unit detects an impact - we didn't for obvious reasons actually test a collision but breaking very hard did seem to trigger this. Once you have stopped your car and turned off the device will normally go to sleep but you do have the option to set motion detect mode which will leave the camera on powered by its built in battery and it will record any time motion occurs in front of it. We found the battery life quite limiting on this - on one particular evening we tried this we only got 2 hours elapsed before the battery fail - it had recorded about 15 minutes of motion in that time. We did do better with 4 hours elapsed and a similar amount of motion later in the week which may speak to some battery conditioning occuring. We have to question the real usefulness of this feature as the camera is clearly on display in the car and anyone with malicious intent is likely to just steal it too. The recording of driving when plugged inthough is truly excellent and we were really impressed by the quality at night where recording was just illuminated by the car headlights. It could often make out more than we could out the windscreen. Unfortunately this reminds us of the flaw that the video was always on - we did work round this by positioning the camera so it was obscured from the drivers vision behind the mirror. One thing to note is that it is important to mount the unit properly and avoid it contacting things like the mirror as the video will pick up any vibrations from car. These can appear as a fairly large judder on the final video. We found mounting the unit firmly near the top of the window minimised this. As well as recording video you can press a button to take a still picture - although we couldn't see a way to do this whilst recording. Once you've recorded you might want to replay the video. You can do this on the device itself either viewing on the small screen or by using a cable to connect to an HDMI enabled output. We were unable to test this as a cable was not supplied with the unit and it is not a fullsize hdmi cable. We liked this a lot but would like to see a better way of selecting the file you want rather than by just file name - perhaps it could read all the files in advance and let you select from a map of your journey which bit to view. 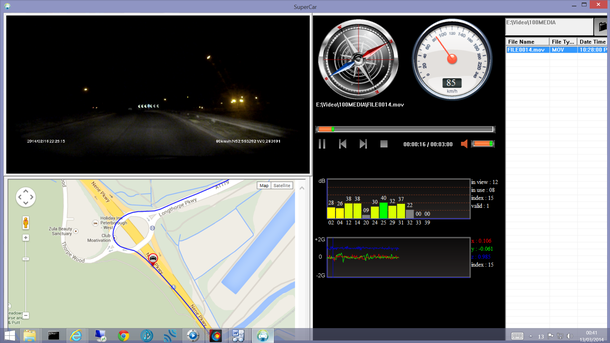 Overall the Rollei CarDVR-110 is an excelent device. It is a shame there is no way to turn off video whilst driving but this could be simply overcome by hiding the screen from the drivers view (we felt the black tape suggestion of one of our colleagues was a little extreme) One thing to also point out is that this is a pretty superb small hand held video camera.